Can you tell me anything about my $25 estate sale find? I recently acquired a pendant that looks to be Native American in design. 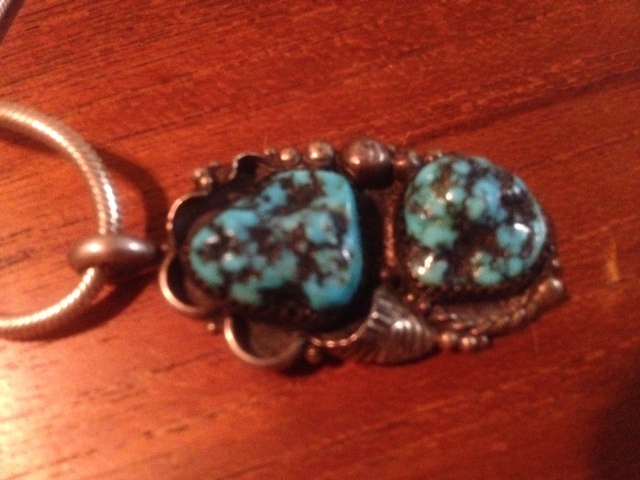 It has two stunning blue turquoise rocks each with a black matrix. I’ve tried to figure out what kind of turquoise those are and the closest match I can make is to Lander Blue, which seems too good to be true, so I would like some identification help with that. My other question for you is about the hallmark on the back of the piece. 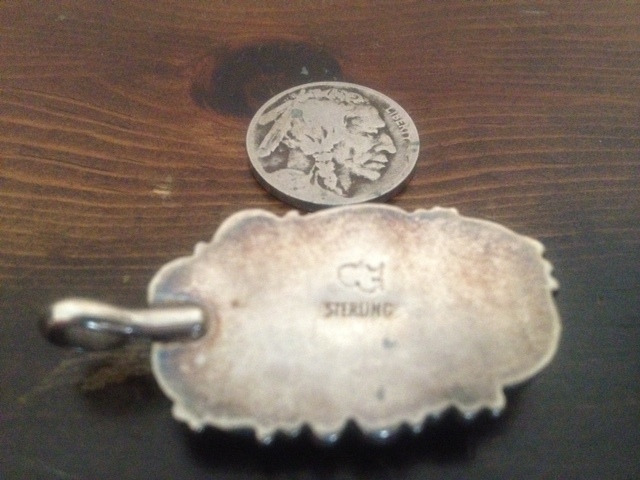 Above the word “sterling” are what look to be two letters, a C and a backwards E. However, I haven’t been able to find whose hallmark that would belong to. Here are some photos of my pendant. I’m not looking to sell, just want some help identifying the turquoise type and hallmark. I bought it a few days ago at an estate sale in Houston, TX and paid $25 for it. That’s all the info I have; sorry I can’t add more! Any help would be appreciated. I love your blog! 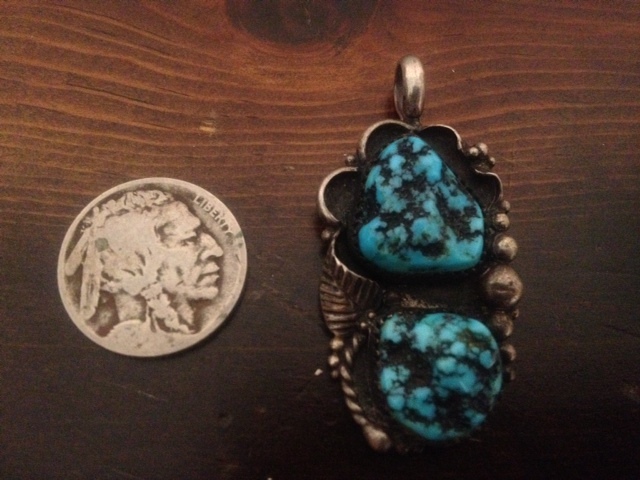 From what I can tell from these photos, these turquoise stones look a lot like some of my Kingman pieces. When I look at the hallmark I see a WF kind of how I would write a round cloud-like W and a simple F, both of them are more like cursive which is how many artists sign when they use an engraver (AKA electric pencil). But as far as whose hallmark that is, I do not know. This entry was posted in Hallmarks, Kingman, Turquoise and tagged hallmark, kingman turquoise, native american, navajo, pawn, pendant, turquoise by Native American Jewelry Tips. Bookmark the permalink.